Our cages are made in house using American steel. Each cage is carefully fabricated on proven jigs, can be installed in under an hour and is guaranteed to fit. Our thru-bolt and clamshell design distributes load over a large surface area of the OEM cage. The bolts act as locating dowels to prevent cage movement. All of our halo cages are designed to retain factory bed-tilt functionality for ease of maintenance and service. 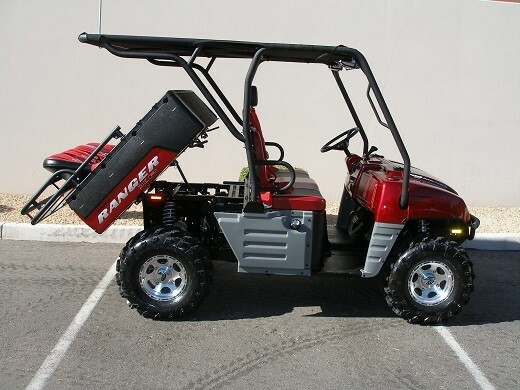 For 2004 and earlier Rangers we offer adapter clamshells allowing for installation on Rangers with 1.5″ diameter rear crossbar. 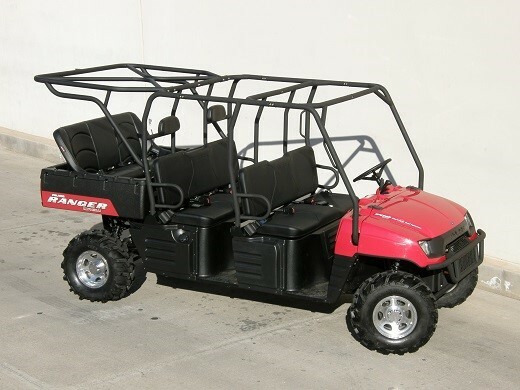 We also make a longer version of our cage for 6×6 Ranger. Our dual-cooler rack mounts in the factory lock and ride holes. We designed our bed stakes to run thru the bed sides with a large area plate that bolts in from the bottom. 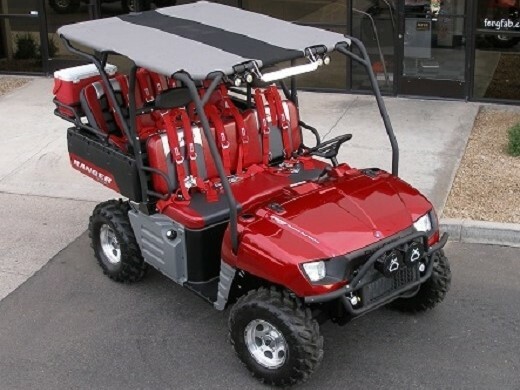 This design provides crash protection and distributes cargo load over the entire bed side. Our rack is large enough for two coolers and a tool bag, and still allows functionality of the factory tailgate. While I don’t recommend it, the design proved strong enough to act as a wheelie bar on the shop ranger preventing a rear roll over. The Basic Cooler Rack comes with one ice chest and a nylon/velcro hold down strap. It has a two bend upper hoop and plastic finishing plugs. It is a bit quicker for us to make and is priced lower. Our Deluxe Cooler Rack features a four bend upper hoop. This design is stronger and keeps any blunt edges away from passenger. It also takes us a little extra time to make so is priced higher. Our canvas tops are made with Sunbrella canvas and are sewn from proven patterns. We use a premium front zipper and attach the sides and rear with Velcro. Canvas tops are available in any Sunbrella canvas and trim colors. Click here for Sunbrella color chart. Stripes also available for an additional $60. We don’t recommend trailering with the canvas top attached. 80 mph wind on the highway can create fraying if the Velcro is not secure. 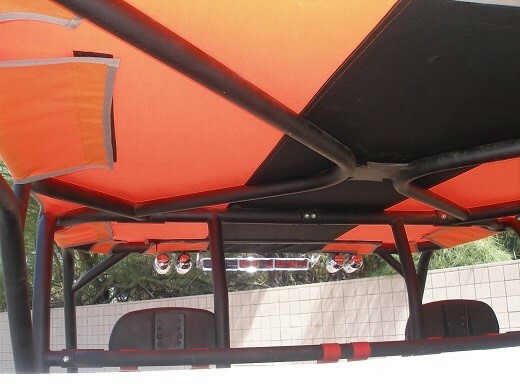 For our local customers we also do custom tin work and can add an aluminum roof to your Ranger. Our aluminum roof product is a custom-made solution which we will make to fit any of our cages or any competitor’s cage. *We don’t offer aluminum lids to our out-of-state customers due to the need to add tabs to the factory cage. Select Finish Type $400- Prices range from $400-$900 depending on mounting and options- Call for Details!$500- Prices range from $400-$900 depending on mounting and options- Call for Details!$600- Prices range from $400-$900 depending on mounting and options- Call for Details!$700- Prices range from $400-$900 depending on mounting and options- Call for Details!$800- Prices range from $400-$900 depending on mounting and options- Call for Details!$900- Prices range from $400-$900 depending on mounting and options- Call for Details! Your kit comes with seat, seat frame, and two automotive lap belts. Removable in less than 5 minutes if you need your bed for another use. Row seat belt upgrade available for $85 more with your Seat Kit purchase. $99 each for 3″ lap x 2″ shoulder harnesses with sewn-in pads.